Republican presidential nominee Donald Trump, speaking Tuesday in Austin, assailed Democratic rival Hillary Clinton as unfit for public office in the wake of new reports about ties to her family foundation while serving as U.S. secretary of state. Reiterating his call for a special prosecutor to investigate Clinton's tenure at the State Department, Trump accused her and former president Bill Clinton of using their foundation to get rich while she was the nation's top diplomat. "It is impossible to figure out where the Clinton Foundation ends and the State Department begins," Trump told thousands at a campaign rally inside Luedecke Arena. "It is now abundantly clear that the Clintons set up a business to profit from public office." Trump's remarks came hours after Fox News published a story about a flurry of correspondence between a senior executive at the foundation and a top aide at the State Department over a two-year period. The Associated Press also reported Tuesday that many people who met with her while she was secretary of state also gave money to the foundation. While batting back Trump's allegations, Clinton and the foundation have taken steps in recent days to quell concerns about its closeness to her if she becomes president. The foundation announced it would no longer accept donations from foreign groups and other entities, while Bill Clinton promised to step down from its board and stop raising money for it. Trump insisted the revelations about the foundation, as well as the controversy over her use of a private email server, amount to a "threat to the foundation of democracy." Border security also factored prominently into Trump's speech, though he stopped short of using the new tone on the issue he debuted hours earlier at a taping of a town hall with Fox News host Sean Hannity. Trump, who campaigned throughout the Republican primaries on a restrictive immigration platform, told Hannity "there certainly can be a softening" on immigration policy to accommodate people in the country illegally who have been contributing to society. At the rally, Trump stuck to more familiar talking points, pledging to build a wall along the border and focus more on enforcing immigration law than the current administration does. Calling Clinton a proponent of "totally open borders," he said she would "catch and release" those in the United States illegally and offer them more benefits than many veterans currently receive from the government. Trump brought several mothers on the stage whose children he said were killed by people in the country unlawfully. They were joined by a number of Border Patrol agents, including one who warned audience members that the country — and their homes — will not be safe until Trump is president. "We are with you 100 percent, and your children did not die in vain," Trump told the mothers, whom he said he met with earlier in the day. Trump also used the speech to continue outreach efforts to minority groups, decrying the state of the economy, education and public safety for black and Hispanic Americans under President Barack Obama. Trump was backed up by introductory speakers including R.W. Bray, the Texas GOP black engagement director who likened the Clinton's support for tough-on-crime legislation in the 1990s to Jim Crow laws. "To those suffering, I say, 'what do you have to lose in Trying Trump?'" Trump said. 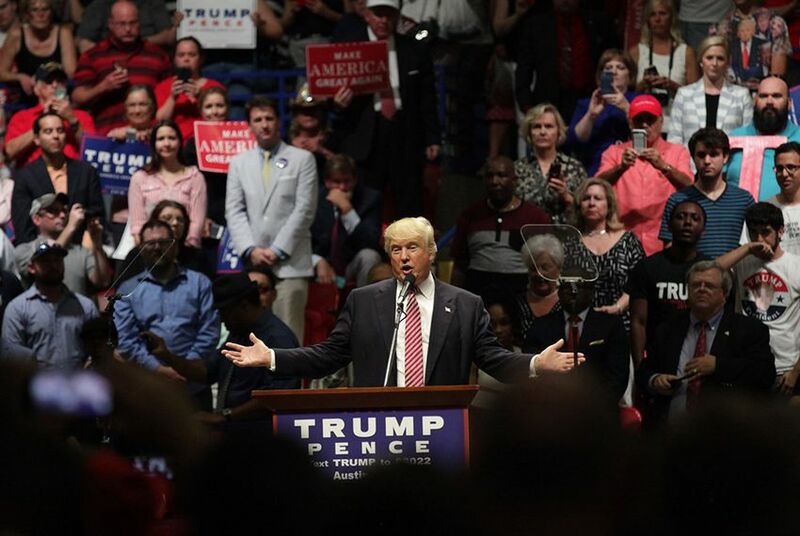 "I say this to the African-American community: Give Donald Trump a chance. We will turn it around." “We will make your streets so safe when you walk down the street, you don’t get shot, which is what’s happening now," Trump added. Trump's presidential pitch was not entirely well received in Austin, one of the most liberal parts of Texas. Trump was interrupted at least half a dozen times, including a minutes-long disruption in which he turned around and watched behind him as protesters were hauled out, including one who flipped a middle finger to the rest of the crowd. "What are you going to do?" Trump asked the audience before quickly returning to his prepared remarks. After another outburst minutes later, Trump was not as gracious. 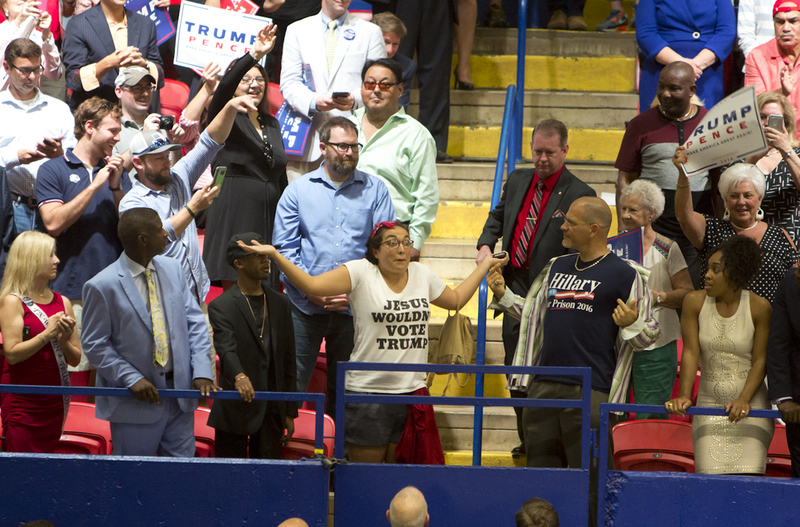 "I will say this: The Bernie protesters were much better. They had much more vim and vigor," Trump said as the situation calmed, going clearly off script. "These are very, very, very little energy." Trump nonetheless had a band of enthusiastic GOP allies in tow, including Rudy Giuliani, the former mayor of New York City; U.S. Sen. Jeff Sessions of Alabama; and Texas Agriculture Commissioner Sid Miller. Introducing Trump, Miller said the "number one reason" he believes the nominee will help farmers is because he can better negotiate trade deals, including the Trans-Pacific Partnership and the North American Free Trade Agreement. Miller saved his harshest words for Clinton, whose election he said would bring the "end of America." "We don’t need you or your friends or your corrupt goons coming to Texas, or much less running the United States of America," Miller said before affording the Democratic nominee a cheeky compliment. "She does know a little bit about agriculture. She’s been milking the taxpayer for about 30 years." 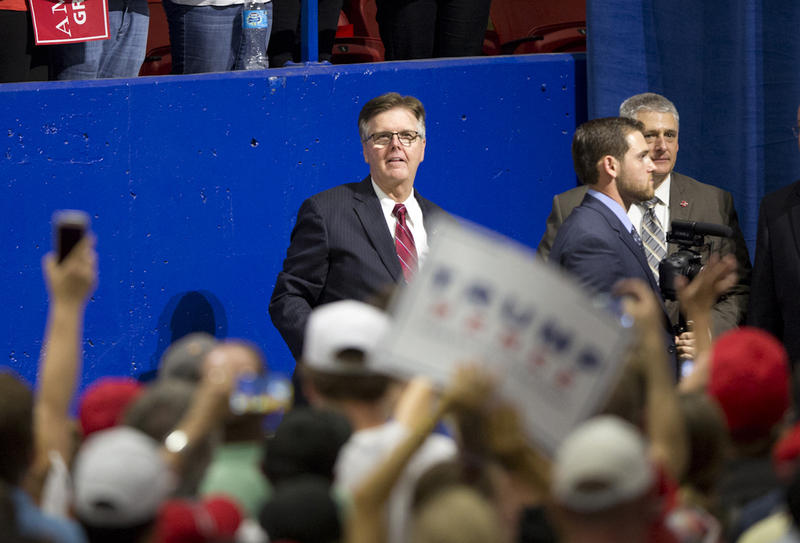 The rally came at the end of daylong swing through Texas for Trump, who also attended a fundraiser in Fort Worth, a television show taping in Austin and a fundraiser in Austin. He was joined throughout the day by prominent Texas Republicans, including Lt. Gov. Dan Patrick and former Gov. Rick Perry, as well as national surrogates such as Giuliani and Sessions. It was unusual trip for a presidential nominee to make to a reliably red state, especially with fewer than 100 days until the election. Texas Democrats held up the visit as a sign that Trump is perhaps worried about his chances in the state, where a recent poll showed him leading Clinton by only six percentage points. After the press conference, protesters held a Love Trumps Hate rally outside the Moody Theater, where Trump was scheduled for the two-hour town hall taping with Hannity. Trump supporters lined up at noon to see their GOP nominee, while protesters with large signs, trumpets and drums chanted support for Clinton or Green Party candidates. Anne Marie Love, one of the first protesters at the scene, said Austin was not a place for Trump to spread messages about mocking immigrants, the disabled or women. Protestors were largely absent outside the Trump rally held at Travis County Exposition Center; their designated area had fewer than a dozen people holding a sign that read, "Trump Go Home." Alejandra Olvera, an undocumented immigrant who came to the United States 12 years ago, said Trump’s plan to deport 11 million people was financially impossible and that Trump will not win. She said she was surprised at the high turnout of Trump supporters in the Austin rally. Elena Mejia Lutz contributed to this report.